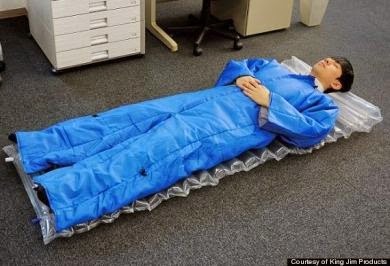 King Jim, a Japanese company specializing in office equipment and supplies, recently started selling a product called the Wearable Futon Air Mat Set. It is essentially an overall made of nylon, polyethylene and polyester and serves as protective work gear as well as a bed. This makes perfect sense in a country like Japan where the work ethic is exceedingly high and encouraging workers to take power naps during their lengthy work day enhances productivity. Indeed a progressive approach, from an enlightened nation. Sadly unlike their famous Toyota products, it is improbable that Japan will be exporting large numbers of these, as many employers outside of that country will be deterred by its potential for abuse. If they were to rebrand it the “Snooze where You Booze Suit” it would make the ideal Christmas gift for that celebrated friend or colleague who much to the amusement of everybody other than his wife, is known as the life and soul of the party. They could also promote it as an item that keeps out the cold and ads an extra degree of comfort, for those who habitually end up in the dog box.